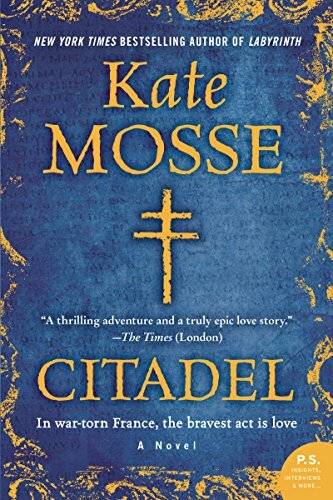 Combining the rugged action of Labyrinth with the haunting mystery of Sepulchre, #1 bestselling author Kate Mosse’s eagerly awaited Citadel is a mesmerizing World War II story of daring and courage, in which a group of determined women fighting for the French Resistance risk their lives to save their homeland . . . and protect astonishing secrets buried in time. France, 1942. In Carcassonne, a colorful historic village nestled deep in the Pyrenees, a group of courageous women are engaged in a lethal battle. Like their ancestors who fought to protect their land from Northern invaders seven hundred years before, these members of the resistance—codenamed Citadel—fight to liberate their home from the Nazis. But smuggling refugees over the mountains into neutral territory and sabotaging their German occupiers at every opportunity is only part of their mission. These women must also protect an ancient secret that, if discovered by their ruthless enemies, could change the course of history. A superb blend of rugged action and haunting mystery, Citadel is a vivid and richly atmospheric story of love, faith, heroism, and danger—and a group of extraordinary women who dare the impossible to survive.